It is Be A HERO’s goal to educate, inspire, equip, and facilitate people of all ages in order to raise up an army of Heroes for an urgent global crisis – suffering children. 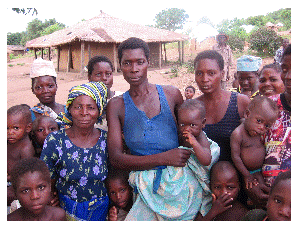 In February 2007, the Be A Hero staff became aware of a developing crisis in Mozambique. Torrential rains had caused massive flooding, and forced government officials to open the sluice gates of the Cahora Bassa dam on the Zambezi River in the central Zambezia Province. The dam, which provides electrical power to four nations, was threatening to burst. The military evacuated by helicopter the residents in the direct path of the floods. An estimated 350,000 homes were lost, and crops destroyed. Those evacuated were airlifted to…..Nowhere. The refugees were deposited into the bush, with no shelter of any sort, no food, no safe water source, no blankets and no provision of aid. As well, Mozambique has also endured two cyclones, and bombings in Maputo. Relief efforts were hampered by government delays and demands, a nasty lot of crocodiles and illness, not to mention the munitions plant where bombs detonated. This created a chain reaction of explosions and unnecessary deaths. The people of Mozambique were in dire straits. No aid was coming to these people except through Christians and this did not go unnoticed by the people in need. 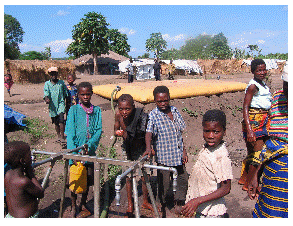 The governor of Zambezia had asked Iris Ministries to provide aid to 7 refugee camps housing an estimated 20,000 people. This organization had been working in the region for the past 13 years and already had an infrastructure in place but no one was equipped to handle the situation facing them at this time. The most urgent needs were food, blankets, tents, seed (bean & corn), hoes and powdered milk. The highest priority was water because the water supply was contaminated and the threat of cholera and other diseases was looming. The government had asked for help but when the supplies began arriving they demanded exorbitant duties on the food we were bringing in. In a nutshell – the people were virtually all sick, all malnourished, drinking filthy contaminated river water. They were living in flimsy straw houses with dirt floors, wearing rags that hung in tatters on their stick frames, while enduring pounding, torrential storms. There were no jobs, no medical care, and no crops planted. (Forget about electricity, roads, toilets, running water, schools, clinics, internet and other “luxuries” the Western world takes for granted). Be A HERO sent aid teams in March and April to distribute food and PUR water-purification packets. PUR was developed by Proctor & Gamble in response to the infamous tsunami. It removes 99.99% of the contaminants, bacteria, viruses, and protozoa that threaten the lives of the refugees through cholera, dysentery, guardia and other water-borne diarrhea diseases. (We consider this “orphan prevention”) This amazing product will provide safe water at a cost of 2¢ per person per day, OR $2.00 per person for 100 days. Many people generously responded to the crisis in Mozambique by delivering the absolute essentials of life, food and clean water. Our HEROES donated almost $100,000.00 for the refugees. It is unimaginable in our North American culture to understand what it is like to take in the sights, the smells, – hearing and experiencing the desolate situation that is real life for the refugees of the Zambezi River floods. The Be A HERO team in Morrumbala discovered the harsh realities that face both the refugees, and those trying to deliver aid to them. There was virtually no medical aid reaching the sick and wounded in the camps. Two doctors were part of our first team in, and they worked almost around the clock with very limited supplies. “We arrived at the camp, and when the news spread that a doctor had arrived people started lining up for care. Hundreds of people lined up. At a camp near Morrumbala, 3000 refugees received a glimmer of hope, and a glimpse of love through our efforts to provide them with food and care for the sick. The food had to be carried about 7 km into the camp, on a small dirt trail. Out of this tragedy lives of all descriptions were changed forever. The crisis situation has passed with the flooding and storms subsided. The government has now relocated all of the refugees, providing them with plots of land to begin rebuilding their homes, their farms, and their lives. The UN has given the people seed, and some of the initial plantings are beginning to be harvested. We have some of the PUR left, which will be used in the months to come, when the heavy seasonal rains inevitably contaminate the wells, as happens every year. Your donations made the difference between life and death for several months while the refugees were dislocated in camps. Many, many lives were saved. A heart-felt thanks to all the donors.